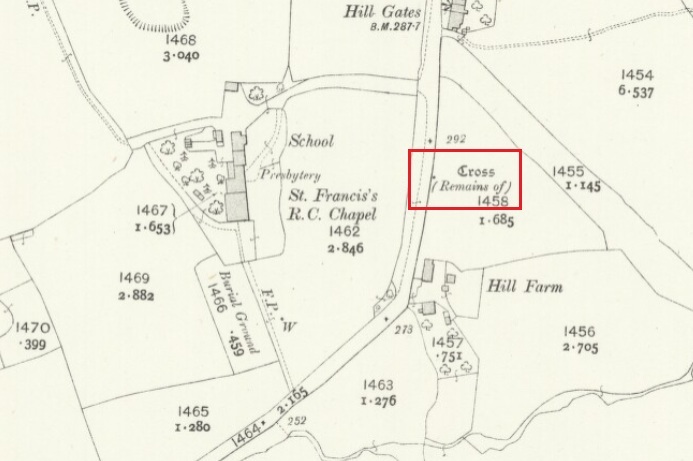 The Cross base is situated in a thick hedgerow on the east side of Horns Lane, opposite St Francis’ Hill Chapel, just to the north of and on the field side of the electricity transmission line that crosses the road at this point. It can be accessed from the field to the north by crossing the stream. In winter the Cross base is just visible from the road side through the hedge. This cross is not described or noted by Henry Taylor in the 1906 edition of his Ancient Crosses and Holy Wells of Lancashire. 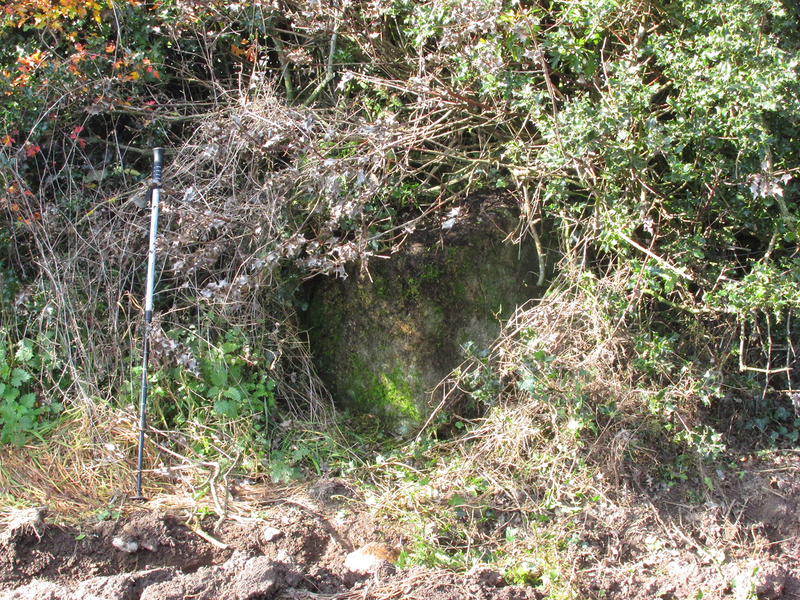 All that survives is the substantial socketed base of what is likely to have been a mediaeval cross. 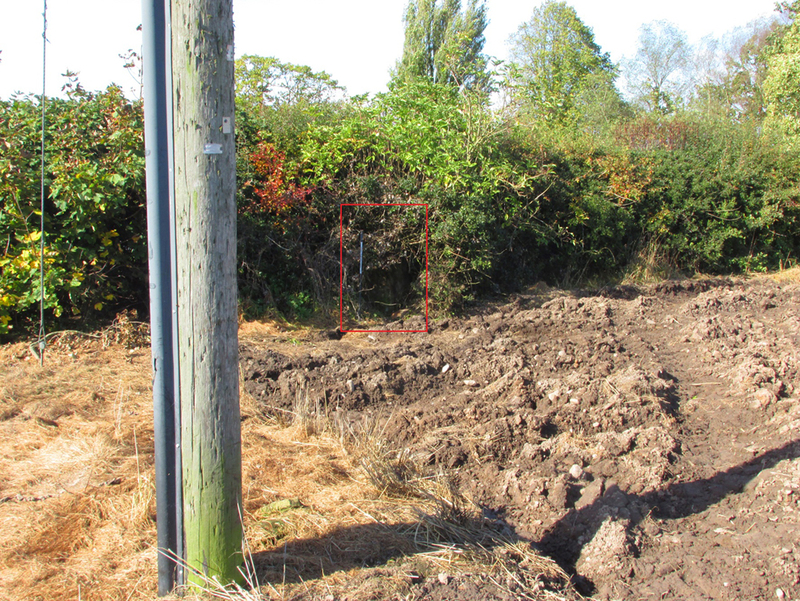 It is almost completely hidden in the hedge, and is only accessible for ‘hands-on’ inspection from the field side of the road. Despite this description, the substantial nature of the base leads me to query why anyone would wish to move it from elsewhere. 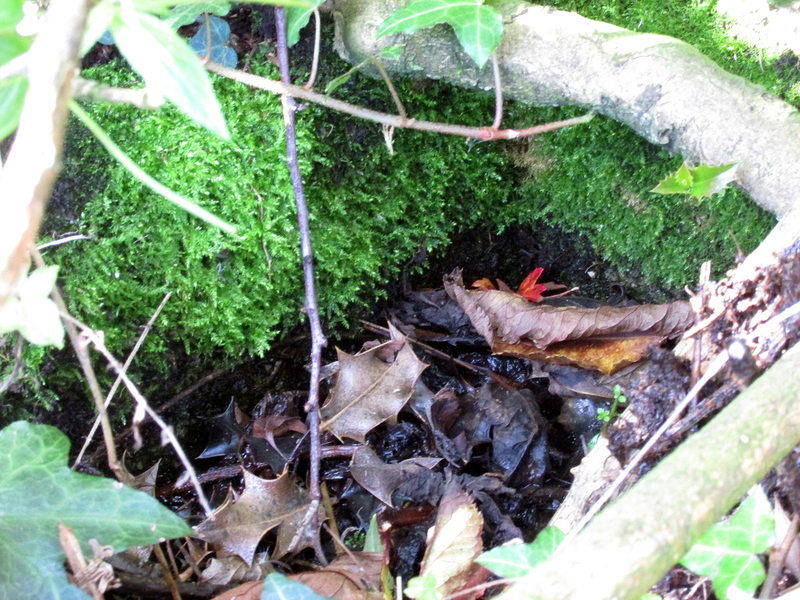 It is more likely that past land-owners have encroached on to the ancient highway, and fenced it accordingly. Maybe the Hill Chapel congregation will at some consider exposing the base on its hill crest position and insert a replica cross? There is no record of what happened to the original Cross. According to a pamphlet describing Hill Chapel, “this house appears to have always been in Catholic hands”, but no mention is made of the Cross. A likely culprit for its destruction is the early nineteenth century Protestant fundamentalist the Reverend Richard Wilkinson. In view of the continuity of Catholic ownership and worship at the Hill Chapel site over the road since before the Reformation, and the sustained persecution suffered by local Catholics in the centuries following the Reformation, it is very unlikely that they would have drawn attention to themselves by erecting the Cross, making it almost certainly of pre-Reformation construction. Anonymous, Hill Chapel Goosnargh, privately published pamphlet available from Hill Chapel, n.d.. This entry was posted in Brigantia (Northern England), Crosses, Lancashire and tagged ancient monuments, ancient sites, antiquarian, antiquities, Archaeology, Brigantia, Crosses, England, english heritage, Goosnargh, Hill Chapel, Horns Lane Goosnargh, Inglewhite, Lancashire, Longridge, medieval history, St Francis Hill Chapel, wayside crosses. Bookmark the permalink.